It is, however, a short episode in the film UN GIORNO IN PRETURA (A DAY IN COURT: 1954), by Steno, which brought Sordi the wild-spread popularity he still enjoys. 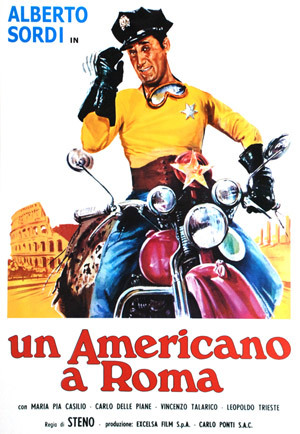 When he appears in an undershirt at the back of the courtroom where he is on trial for having swum naked in the river and says, as if presenting his calling card: "Indecent conduct, Mr. Judge, indecent conduct," a character is born and fills the screen: Nando Moriconi, the "Americano". He is a boy from the working-class suburbs, illiterate and maybe a little stupid, who has assimilated the "American way of life" from films and newspapers, speaks in a funny way that is meant to be Anglo-Saxon but immediately switches to Roman dialect and dreams of skyscrapers, gunmen, the Far West, gangsters, cops, everything that reaches him from American films. The story concerning him - he went swimming in the river and some urchins steal his clothes, so he is forced to go home naked - is little more than an anecdote, a filmed joke, but Nando Moriconi is a figure out of the ordinary who excites both laughter and tenderness in his gentle meglomaniac folly. The figure would return immediately after in UN AMERICANO A ROMA (AN AMERICAN IN ROME: 1954), again by Steno, in a film all for him and with a script in which Ettore Scola also had a hand. It's a sort of biography of Nando Moriconi, an unsuccessful vaudeville dancer with the state name (Americanized, of course) of Santee Baylor, from the time of the Nazi occupation to the post-war period, in a crescendo of disasters brought on by his mania for dressing up, among other things, as an American cop. Twenty years later, Nando Moriconi would be "fished out" again for an episode in the film DI CHE SEGNO SEI? (WHAT'S YOUR SIGN: 1975) by Sergio Corbucci, in which the one-time youngster, now a grown-up man but still a "big baby" in spirit, crowns his American dream with a uniform and a motorcycle like the ones used by American cops, hired as a private bodyguard to protect a rich tycoon frightened of terrorists. Sordi, born in the famous Trastevere quarter of Rome, is ideally suited to playing the "Roman of Rome" in the spirit of popular humor, drawing upon his personal experiences to invent typical Roman "characters". In GUARDIA, GUARDIA SCELTA, BRIGADIERE E MARESCIALLO (PRIVATE, PRIVATE FIRST-CLASS, CORPORAL AND SERGEANT), directed in 1956 by Mauro Bolognini (and written by Maccari, Scola and Manzari on a story by Paolo Frasca) he incarnates, very realistically with only a few, essential comic touches, the part of a policeman who plays in the Police Department Band and studies French with the secret ambition of becoming an interpreter. In LADRO LUI, LADRA LEI (HE THIEF, SHE THIEF: 1954) by Luigi Zampa (written by Franciosa and Festa Campanile, Zampa and Sordi) he is Cencio, a small0time professional thief by age-old family tradition, who from childhood and with unshakable optimism alternates periods in jail and periods of freedom. In FORTUNELLA, directed in 1958 by Eduardo De Filippo, but on an idea by Fellini, he is a modest secondhand dealer who is actualloy a "fence" and who does not hesitate to send his mistress to jail in his place (those negative heroes begin to appear which Sordi took up from time to time with no fear of diminishing his popularity). He plays a similar role in NELLA CITTA L'INFERNO (HELL IN THE CITY: 1959) by Renato Castellani, where he is Adone, the boy-friend of a housemaid who ends up in jail for a robbery organized by him. COSTA AZZURRA (RIVIERA: 1959) by Vittorio Sala finds him in the role of a fruit-seller momentarily carried away by the mirage of becoming a movie star. IL VIGILE (THE POLICEMAN: 1960) by Luigi Zampa presents him as a jobless man of no great intelligence, Otello, who as the result of a recommendation becomes a policeman and learns at his own expense, having attacked the mayor of the city, that to get along in the world you have to wait upon the powerful. So he lets the mayor drive his fast car into a street where it is prohibited to go and now the mayor, how had insisted upon being let by, ends up in a ditch. In LO SCOPONE SCIENTIFICO (THE CARD GAME), written by Rodolfo Sonego and directed by Luigi Comencini, he is "borgataro" (a man from the working-class suburbs) who every year, during the holiday and tourist season, is called by an eccentric old American millionairess who lends him a million to play cards ("scopone scientifico," a sort of cassino) against her, certain that in the end she will win it all back. This bitter and paradoxical story, ending on an unexpected note of black humor, derives much of its comic flavor from the contrast between two actors as different in style and tradition as Alberto Sordi and Bette Davis.